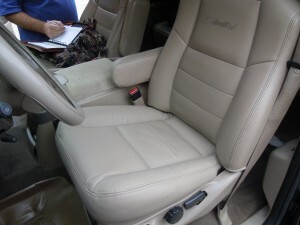 2003 Ford Excursion Replacement Leather Seat Cover – Before and After Pics!!! Here’s the deal…Yesterday, we did a driver bottom and arm rest replacement leather install on a 2003 Excursion Limited with the Medium Parchment interior. 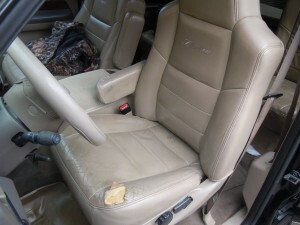 These before and after pictures will show you how well our replacement leather seat covers match with the OEM interiors. We guarantee the covers to match with the original factory color pallet. You will most likely need to clean your leather seats to get the shine off of the leather. You can see the wear and shine on the seat top in the first picture. Once we replaced the seat bottom leather, we cleaned the original factory top to get rid of this shine. You can definitely notice the difference. Check out the befrore and after pictures!!! Again, this is the OEM seat top with a new leather replacement cover from The Seat Shop. Our covers do not slip-on over the seat covers. They are 100% replacements. Please give us a call if you have any questions about your Ford or GMC Truck or SUV!